6 year old Champion - SPSS registered George Clooney B.S. At the 2017 British Dressage Young Dressage Pony Championships SPSS registered/graded ponies did exceptionally well with all 3 age Champions being SPSS registered and both the stallion winners are also SPSS graded. The Championships were for 4, 5 and 6 year old dressage ponies and took place on Sunday 9th July at the Hartpury Festival of Dressage. Ponies had to qualify by scoring 7.0 or more and placing in the top 3 at one of the qualifying competitions. 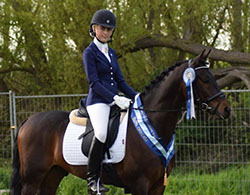 At the Championships, for each of the age classes, the SPSS supplied special rosettes for both the highest scoring SPSS registered (so SPSS passported or overstamped) pony and the highest scoring British-bred pony. Hence, we are delighted that the "Best SPSS" rosettes went to the 3 Champions and that 2 of them also received the "Best British-bred" rosettes, with the other going to the 2nd placed 4 year old. Recipient of the first "Best SPSS" rosette on offer was the 4 year old Champion, the SPSS graded stallion, Chartstürmer WE. "Charti" was bred in Germany and is by Caramel WE out of SPSS Head Studbook graded Greatest Hit (FS Golden Highlight x Catherston Nightsafe). Owned by Ann Marie Manning since he was a weanling and both ridden and produced by her sister Jennifer, Charti came to the UK as a rising 3 year old and, impressively, has so far not been beaten in competition. In second place and receiving the SPSS sponsored rosette for Best British-bred was the British-bred (by Mrs K L Curtis) WPCS Sec C mare Penbee Savannah (Dabernon Replica x Felinmor Ringmaster) who was ridden by her owner Abigail Edwards. Then in 3rd place was the German bred gelding VSH Don Diego (Dimension AT x A Gorgeous) who is owned and ridden by Donna Lockhart. The six year old title went to yet another SPSS Registered and British-bred pony, the grey gelding George Clooney B.S. (Caesar 171 x Santano). George was ridden by Sophie Taylor who was on the GB Pony Europeans Team in both 2016 and 2017 with Becky Moody's SPSS Elite graded Madam's Miss Maria. George was bred by Julie Lockey, who also bred his full sister, SPSS Elite graded Ella, a member of the Irish Dressage Team at the 2016 Pony Europeans who is now competing internationally for GB ridden by Sophie Williams. 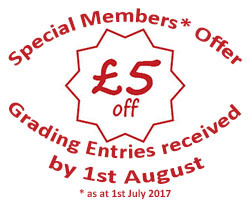 Note that there is a Special Offer for those who are SPSS Members on 1st July 2017 of £5 off each Mare/Stallion Grading Entry provided mare/stallion owner is an SPSS member on 1st July 2017 and entry (including full payment) is received by 1st August and includes the coupon in the June 2017 SPSS Newsletter. Note that this newsletter will be sent to all those who either join as new members or renew lapsed membership by 1st July. Entries are now open for the 2017 SPSS Mare & Stallion Gradings and Youngstock Evaluations. With the Tour starting on Friday 8th September and going to a range of venues in England & Wales before finishing in Scotland on the 15th September, we hope that we are within a reasonable travelling distance of most members. If we're not, then please let us know and we'll try to get closer next year! This Championships, for 4, 5 and 6 year old dressage ponies, takes place on Sunday 9th July at the Hartpury Festival of Dressage. Ponies have had to qualify by scoring 7.0 or more and placing in the top 3 at one of the 7 qualifying competitions. Our congratulations to the breeders, owners and riders of all these ponies and we look forward to seeing them all excel at the finals. (SPSS Elite RFS Socrates x Sir Donnerhall I) & Eleanor J Cooper. Winners of the 5 year old Young Pony Qualifier at Houghton Hall. The SPSS is delighted to announce that British-bred and SPSS graded RFS Socrates has been awarded the coveted SPSS ELITE graded status in recognition of his representing Ireland at his first international competition, CDI Sint-Truiden in April 2017. Huge congratulations to RFS Socrates' owner and breeder SPSS member Jo Wright and his rider Leah Murphy, who did a great job introducing this young pony, who was 7 on the day of the Team Test, to the excitement and pressure of the international pony competition circuit. There are separate sections for 4, 5 and 6 year old ponies (who must not exceed 149cm). Ponies will be seen in pairs at the qualifiers and will ride a commanded test NOTE THAT, at the first qualifier, different tests were used to 2016 (despite BD informing us that these were the 2017 tests too!). Then the top 6 ponies will return to the arena for final judging. The top 3 ponies (provided they score 7.0 or more) will qualify for the final where they will be judged on their performance in a test (tests to be confirmed by BD). At the Championships, for each of the age classes, the SPSS will present special rosettes to the highest scoring SPSS registered (so SPSS passported or overstamped) pony and to the highest scoring British passported pony. Past winners of these classes have gone on to win Team Silver & Individual Bronze medals at the Pony European Championships (Der Kleine Lord ridden by Alexandra Hellings) and be 2015 BD National Medium Restricted Champions (Cruz ridden by Jayne Turney). Cruz and many of the other past finalists have gone on to compete internationally - including LE Chiffre who was part of the 2016 GB team at the Pony Euros. 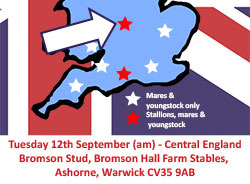 In 2016 we conducted another hugely successful Mare Grading & Youngstock Evaluation Tour and we are delighted to announce that we will be doing another tour this year. 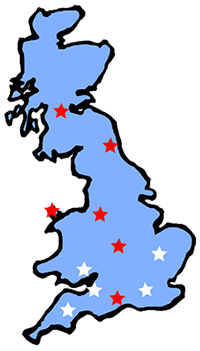 The 2017 Tour venues are being planned at the moment, so if you want us to come to your area, please email entries@sportpony.org.uk with information about the number of mares and youngstock you expect to have as well as venue suggestions - we will do private stud visits (for sufficient numbers) if we are in the area. There will also be a central Stallion Grading in September - and we may do another in Scotland if there is sufficient support. The SPSS will be attending the Stallion AI Services & Twemlows Stud Open Day and Stallion Parade on 22nd April at Twemlows Hall Stud Farm AI & ET Centre and we're really looking forward to seeing the SPSS graded stallions who are attending. Please come along to our stand for more info on our 2017 SPECIAL OFFER on foal registrations and our 2017 events. We are delighted to be supporting British sports pony breeders in their breeding operations by offering a £25 discount from the passport application fee for all 2017 foal passports applied for by 1st November 2017. So if you're breeding sports ponies, plan ahead to take advantage of our offer and passport with the only UK society whose primary focus is the breeding, production, evaluation & licensing of competition ponies for FEI disciplines. British passports for British ponies! SPSS Elite graded stallion Littledale Bright Star was awarded the Competition Stallions Award for the Top British-based Pony Sire of Sports Ponies in the 2016 Futurity at the British Sports Horse Stallion Event on the 7th January. At the same event, SPSS Studbook Manager, Lucy Sheldrake, took the opportunity to also present Littledale Bright Star with the 2016 SPSS Dancer Medal. The Dancer Medal is given annually by the SPSS to a worthy pony and for 2016 it went to Littledale Bright Star in in recognition of his being the first SPSS passported stallion to sire a pony or horse competing in FEI international competitions. Littledale Bright Star was also being presented with a sash and rosette to mark his elevation to SPSS ELITE Stallion status. This highly coveted status is only awarded to SPSS graded stallions and mares who either compete internationally themselves or sire an international competitor. In Littledale Bright Star’s case, he is the sire of SPSS passported Catherston Bit of Gold who was clear in the 1.25m class at the 2015 Keysoe 2* International Showjumping (CSI) competition and of Prairie Star who completed the 2*International 3 Day Event at Hartpury in 2012. The 2016 SPSS AGM was held on Friday 6th January 2017 at De Vere Horwood Estate in Buckinghamshire. All resolutions were passed, including revisions to the Rule Book and the Memorandum & Articles of Association. The 2016 AGM Minutes (including associated documents) may be viewed/download here and the new 2017 SPSS Rule Book can be downloaded from here or can be sent by email or post (contact the Studbook Office to request). At the 2017 Breeders Dinner & Awards Ceremony (organised by the British Horse Foundation), the SPSS sponsored Pony Performance & Breeding Award was presented to SPSS passported and Elite Graded LE Chiffre (Caesar 171 x Donnerwetter). 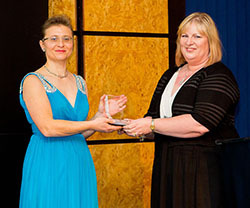 The award was presented to LE Chiffre's breeder, Bev Brown, by SPSS Director, Lucy Sheldrake. At the 2017 British Breeders Awards Dinner SPSS members achieved a “clean sweep” of Sports Pony BEF Certificates of Merit and all of these top youngstock were by SPSS graded stallions with Penny Walster’s Bathleyhills Monet siring both the Yearling and 2 Year Old winners. Penny Walster's Bathleyhills Mystery Machine (s: Bathleyhills Monet d: Bathleyhills First Mystery) the top scoring Sports Pony 2 year old. Our congratulations to all our breeder members, not just those listed above as successful in the futurity series, but also those whose progeny gained SPSS Premiums in our own evaluations. Copies will also be available at the 2017 Futurity Evaluations, all SPSS Events and selected other events this summer. 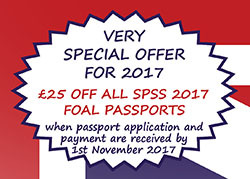 The full colour booklet includes SPSS Notices and highlights from 2016 as well as featuring 40 of the SPSS stallions in the Stallion Guide section PLUS detials of the offer of £25 off the standard cost of a SPSS passport for 2017 foal passports when passport application and payment are received by 1st November 2017 . 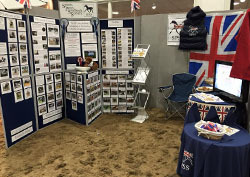 The SPSS will be at the British Bred Sport Horse (BBSH) Stallion Event at Bury Farm Equestrian Village again, on Saturday 7th January from 11am to 8.30pm. As in previous years, there'll be a trade stand area, top class stallions, international riders and an evening spectacular. More information including how to get tickets is available here. Just to wish all our members and supporters a very happy and successful 2017 and thank you for continuing to support the SPSS. 2016 was another fantastic year for the Studbook with once again significant increases in the number of passports issued as well as the number of registrations (ie overstamping of other societies’ passports). This means that since the current Studbook Manager took over in April 2014 and re-invigorated the Studbook, the previous trend of decreasing numbers has been reversed and the Studbook is once again building on the effort put in by those who started it and consolidating it’s position as the only UK studbook specialising in the identification, grading and registration of ponies with sporting potential. In 2016 we conducted another hugely successful Mare Grading & Youngstock Evaluation Tour and we are delighted to announce that we will be doing another tour this year. The 2017 Tour venues are being planned at the moment, so if you want us to come to your area, please email or with information about the number of mares and youngstock you expect to have as well as venue suggestions - we will do private stud visits (for sufficient numbers) if we are in the area. There will also be a central Stallion Grading in September - and we may do another in Scotland if there is sufficient support. 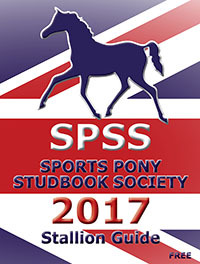 Following the closure of the Scottish Sport Horse (SSH) Studbook, the SPSS is very pleased to announce that, in collaboration with Sport Horse Breeding of Great Britain (SHB(GB)), we are able to assist with any queries relating to ponies passported, graded or registered by SSH, as ponies do not fall under the remit of Sport Horse Breeding (GB) who have taken over the business of SSH. As such we will happily accept SSH graded ponies into the relevant section of our studbook and can deal with ownership / detail changes for any SSH passported ponies. 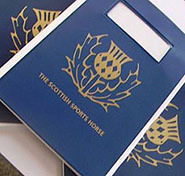 We are also very happy to issue passports for foals by SSH graded pony stallions or out of SSH graded pony mares. Please contact our Studbook Office via or 07703 566066 if you have SSH ponies or wish to discuss this situation further. The Information/FAQ and Passports pages contain guidance about how to get a passport for your foal - PLEASE READ before submitting a passport application as it will help the SPSS Studbook Office process your passport quickly and mean that you won't have to get your vet out again to complete missing paperwork/DNA/ID chip. Note that, with effect from 1st March 2016, DNA parentage verification will be required before an SPSS passport can be issued for ALL LATE APPLICATIONS and/or where the vet completing the Identification Form section (pages 4 & 5) of the Passport Application Form is not able to carry out foal ID whilst on its genetic dam eg foal has already been weaned or is an ET foal seen with the recipient mare. SPSS passports issued from 1st January 2016 are fully compliant with the latest EU Equine Identification law and DEFRA Minimum Standards. The SPSS operates the Studbook to the same standards as expected of a World Breeding Federation for Sport Horses (WPFSH) member - but cannot become a member as our focus is on the breeding of Sports Ponies not horses!